Cappadocia Undiscovered Tour starts at 10:00 and offers the more remote and serene locations in Cappadocia including the deepest underground city of Turkey, an old Greek Village, beautiful cave monastery and the magnificent Soganli Valley among other highlights. Your Cappadocia Undiscovered tour begins with a pick-up at your hotel and a drive to Mustafapasa, the former Greek Village Sinasos with spectacular architecture. We will walk around the village, learning about the population exchange from 1924, the wealthy merchants and locals who once thrived in this town. 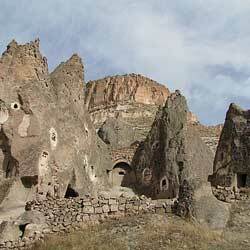 The next stop will be Soganli Valley, one of the most secluded and tranquil valleys in Cappadocia. We begin our hike along one side of the valley, visiting many cave churches and we return along the other side of the valley to the quaint village. You will also have your lunch in this lovely valley. 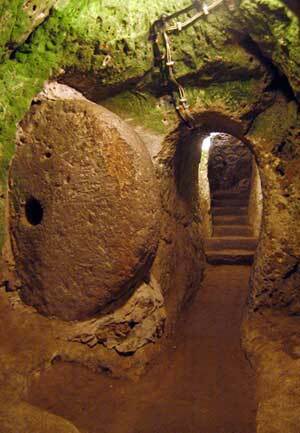 After having lunch, we will drive to Derinkuyu Underground City. Used to be known as Melagobia, Derinkuyu was one of the biggest settlements in Cappadocia and its 8 level underground city is the deepest of the region today. We will explore the caves of this interesting city and talk about the way of life here.